Fall is in full swing. The kids are back in school, the temperatures have dropped and it’s time to prepare for the flu vaccination. Every year, influenza sickens millions, hospitalizes thousands and is a life-threatening danger to some. The flu isn’t your average common cold. It is dangerous for anyone who already has health issues and it can be dangerous for healthy adults and children as well. Getting a flu shot is quick and easy and it is a crucial way to protect your children from a potential health risk. Unfortunately, about 35 percent of parents are unlikely to seek vaccinations for their children. Some parents just don’t realize just how serious the flu can be. Many children don’t receive a flu shot even though it has been recommended for those over the age of six months since 2010. Nationwide polls show that many parents base their decisions about the flu vaccine on what they hear and what they read. They also heed the advice of friends and family members when making this decision. Health care providers play a key role in conveying accurate messages and dispelling myths about the flu shot. The flu vaccine is your best protection from the flu. 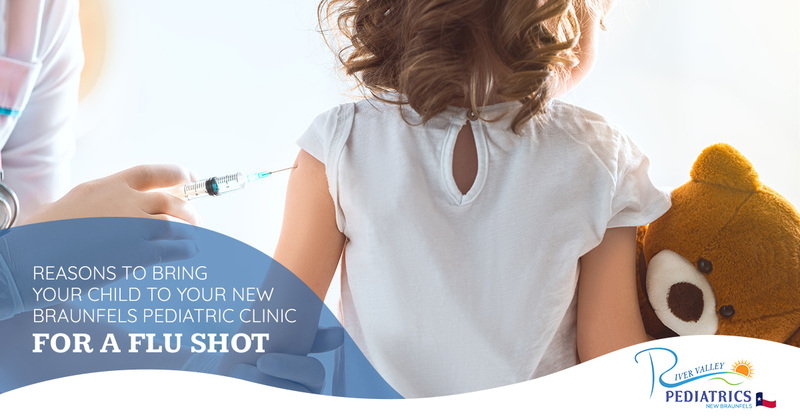 River Valley Pediatrics, your pediatric clinic in New Braunfels, offers the reasons you should get the flu shot for your children. Children under the age of two are at a higher risk of getting the flu because their immune system hasn’t fully developed. Your children don’t have the same ability to fight off severe infections as adults do. They need an extra boost to help protect them against the dangers the flu bug presents. At such a young age, the flu can lead to complications that can require hospitalization. Your older child might overcome the flu just fine, but their younger sibling might not be so lucky. Not all children deal with the flu in the same manner. In addition, just because a child isn’t sick does not mean they can’t still carry the virus. You can pass the flu to others even if you don’t get sick. The flu changes year after year. Just because you or your kids didn’t get the flu last year, it does not mean you can’t get it this year. Scientists determine which strain of the flu is most likely to spread and develop a vaccine for it months in advance. And since the vaccine is about 60 percent effective, it is still possible to come down with the flu. However, even if your child does come down with the flu, the vaccine will help make it much less severe than if they had not been vaccinated. The flu vaccination has been shown to reduce the dangerous risks that can accompany the flu bug. The flu isn’t just a cold. The flu is a deadly and highly contagious illness that can cause serious harm to children. The flu can keep your child in bed for a week or more with a fever, body aches and a painful cough. The flu can also lead to some pretty serious complications including severe dehydration, pneumonia and hospitalization. Each year, 20,000 children under the age of five are hospitalized due to complications from having the flu. Contrary to what you may have heard, the flu shot does not make you sick. The vaccine is made of either a weakened virus or inactivated flu virus that cannot cause the flu. Still, there will be a small percentage of children who will experience a brief soreness and swelling at the injection site. Just as you take your children ion for annual checkups, a flu shot every year should be the routine. The vaccine is your child’s best defense against the flu. We urge you to think beyond the minor inconvenience of having to bring your child in for a flu shot. Think about how inconvenient it would be if you had to stay home from work for several days to care for your sick child. Give River Valley Pediatrics a call today and schedule an appointment.